One of the pleasures I afford myself regularly is homemade granola. I make a batch every two weeks or so along with 2 litres of fresh homemade yogurt. Not much could be finer! Beckham, my Great Dane/Golden Lab was hard at work picking up wee bits of oats that hit the floor as I stirred the granola. He’s posing here, showing off his most-excellent-helpfulness-in-the-kitchen skills. 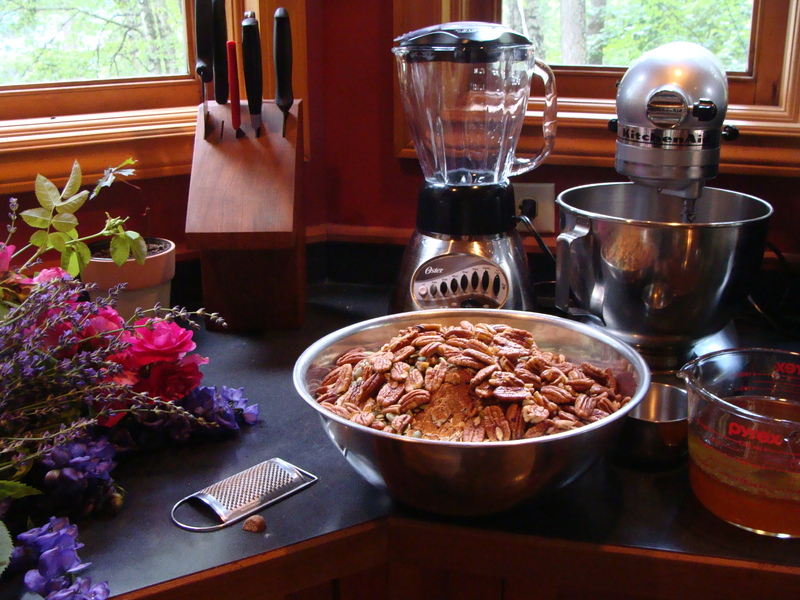 The granola recipe is one that my sister Laura and I have adapted over the years from a variety of recipes. Here’s granola caught in process today. Nutmeg has just been grated in and the pecans and pumpkin seeds are added. Honey and oil are ready to be mixed. Today was a busy day in the kitchen. As well as granola, I made a batch of Pumpkin-Apricot muffins. It’s that time of year when I am clearing out the freezer, so defrosting one of last fall’s packages of steamed pumpkin made for an easy muffin feast. Check out the recipe in the Muffins section!